—Ken Saro-Wiwa, executed for environmental advocacy, Nigeria, Nov. 10, 1995. I know a lot people targeted by our federal government and corporate private security for their organizing work. We’ve got the FBI targeting environmentalists, anarchists and Occupiers as “terrorists.” Homeland Security leads crackdowns on Occupy Wall Street. In Rising Tide circles, we’ve got the feds investigating campaigns fighting fracking and tar sands heavy hauls. Not to mention the shadowy private security surveillance of oil companies and banks watching us. The violence against environmentalists outside the U.S. has been only increasing. London-based Global Witness just published a new report saying that more than 700 people (more than one a week) died in the decade ending 2011 “defending their human rights or the rights of others related to the environment, specifically land and forests.” In 2010, 96 environmentalists were murdered. In 2011, the number killed was 106. A large portion has been concentrated in Brazil, Columbia and Peru with large numbers coming out of the Philippines. All have been bloody campaigns between Indigenous groups and powerful industry. They were killed, the environmental investigation group says, during protests or investigations into mining, logging, intensive agriculture, hydropower dams, urban development and wildlife poaching. 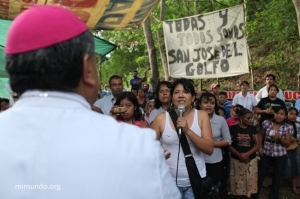 Just last week, an anti-mining activist, Yolanda “Yoli” Oquely Veliz, fighting a Canadian-owned Radius Gold was shot when leaving a community blockade near a gold mine entrance in San José del Golfo, Guatemala. She survived being shot three times (at least last I heard), but is in critical condition. Over the past couple of years, there has been much deadly violence in Central America and southern Mexico around mining and logging campaigns. In the U.S. as groups like RAN and Greenpeace plan and carry out daring actions on coal plants, cranes and other high-rise structures. Grassroots groups militantly block mining and logging operations with road blockades and tree-sits. People fed up with environmental and economic injustice occupy streets, banks and gov’t offices. The response by law enforcement and non-governmental security actors has been non-lethal in the recent past. Pepper spray, tasers, billy clubs and rubber bullets are brutal and violent, but they aren’t bullets and machetes. BUT people in other parts of the world using similar tactics are facing assassination and brutal violence. Furthermore, in the US and Canada, activists from lower income and traditionally marginalized communities face higher risk as well. Just a couple of months ago, our friend and ally Larry Gibson (anti-mining activist in West Virginia), who has survived more than one “drive-by” on his home, had his home burglarized and vandalized in retaliation for his outspoken position on mountaintop removal coal mining. Global North-based social and environmental movements have a lot of privilege. Direct action is a privilege which has been stepping into its own power of late. Our movements often use this “laboratory of resistance” to push for a greater good, but it needs constant self-reflection. How do we use our power and privilege towards our less privileged allies appropriately and respectfully? How do we do it in a way that continues to support folks facing deadly risks around the globe?